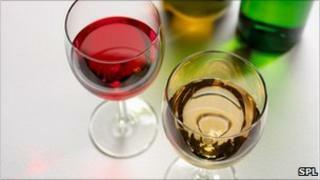 An alcoholic drink a day can help keep heart disease at bay, according to a review of 30 years of research. Another article, by the same Canadian research group, showed alcohol increased "good" cholesterol levels. But experts said this was not a reason to start drinking. For many years, studies have suggested that drinking alcohol in moderation has some health benefits. This review showed that the overall risk of death was lower for those consuming small quantities of alcohol, 2.5g to 14.9g, compared with non-drinkers. The researchers also say regular moderate drinking reduced all forms of cardiovascular disease by up to 25%. However, while consuming small quantities of alcohol had a beneficial effect on the number of strokes and stroke deaths, the risk increased substantially with heavier drinking. Professor William Ghali, from the Institute for Population and Public Health at the University of Calgary, told the BBC: "Our extensive review shows that drinking one or one to two drinks would be favourable. "There is this potentially slippery slope, most notably with social problems and alcoholic cirrhosis of the liver, but the overall mortality including cancer and accidents shows you would be better with alcohol." Cathy Ross, senior cardiac nurse at the British Heart Foundation, said: "This analysis of previous studies supports what we already know about moderate drinking reducing our risk of cardiovascular disease. "However, drinking more than sensible amounts of alcohol does not offer any protection and can cause high blood pressure, stroke, some cancers and damage to our heart. "If you don't drink, this is not a reason to start. Similar results can be achieved by being physically active and eating a balanced and healthy diet." The researchers believe any beneficial effects are down to the alcohol itself, rather than anything else in a drink. Their second study suggests that drinking up to 15g a day for women or 30g for men increased levels of good cholesterol, adiponectin and apolipoprotein, which have been linked to a healthy heart. They said this pattern was true for all types of beverage. The research group believes that governments may have to change their messages on public health to argue for drinking alcohol in moderation. Prof Ghali said: "There's no doubt a public health campaign would be controversial. We need to ponder the message of how a doctor talks to a patient and how the government talks to the people." Professor Lindsey Davies, president of the Faculty of Public Health, added: "It just strengthens the argument that a little bit does you good, but a lot does you harm, but that always makes a public health message hard."